We are about to list off the best sixMini Air Hockey tables. Air hockey is a great past time, especially for young ones. The full-sized tables are a ton of fun; however, kids are a lot shorter than adults. So, how can you find a solution that will deliver the experience you want them to have without waiting a bunch of years for them to grow? There is a really simple answer, fortunately. Go Mini! Really small alternatives might not pack as great a punch as the full-scale versions, but they are a great substitute nonetheless. Sacrificing a bit of power to create an option that is flexible to almost any flat surface is invaluable for their ages. Plus, you can usually store these mini tables out of the way when they aren’t in use. Believe it or not, there are a respectable number of selections available. You have varying lengths of tables, as well as electric and battery powered options. Of course, you need to think about space and the ease of simply picking the table up for a brief moment and getting it out of the way without any major adjustments. Also, keep in mind that not all air powered units are equal in their strength or even in air distribution. Some of the tables in the following list are for older children, and a couple of them are for younger children. Remember, when a table is battery operated, that means you will need to get the corresponding batteries separately. Hopefully, with this quick rundown you can figure out what would work better for you and your family. The Sports Squad HX40 Air Hockey Table is best for people who want a tabletop that looks like and plays similarly to the full-scale version. This table maintains consistent and even air flow with its electric power. Your experience will be quick paced and smooth. It features great durability with the quality of wood it is constructed with. It can be stored or moved with little effort and is great for small spaces. The feet have rubber pads to ensure your floors and furniture are kept from being damaged and the game won’t slide around. You can also easily keep score with the manual counters. The Westminister Air Hockey is the best Mini Air Hockey Table for your toddlers. They can feel the hype when they score! Non-stop action after non-stop action with this Air Hockey table. Two red paddles and a couple of pucks are included, as well as manual score counters on both sides. The puck will glide smoothly on a nice layer of air. Requires 6 AA Batteries – sold separately. The Mainstreet Classics 35-Inch is the best Mini Tabletop Air Hockey and is designed for people who want to maximize their Air Hockey experience at an affordable price point. This table supplies an excellent compromise between space and the natural experience of a full-sized table. Its compact design offers improved portability and easy storage. All you need is a flat surface, and you are ready to unleash the fun. The 110V motor gives solid air flow for a more genuine experience. This set includes two pucks and a couple of paddles, along with sliding score counters for easy score tracking. The PlayGo Air Hockey Arena is the best Mini Air Hockey solution for getting your young kids into Air Hockey. It is an exciting game for two. Let your children test their reflexes and show who is boss. It can be played wherever there is a flat surface. This table is a condensed form of other tables that are considered standard gameplay tables. Enjoy the puck floating and sliding back and forth in the game. The mallets are easy to hold onto and will help them strike the light puck easily. The Hathaway Blue Line Portable is the best Mini Air Hockey option for people who need better gameplay than standard mini tabletops but without being much bigger. 32-Inch model saves space, isn’t heavy, and is very portable. The battery-operated blower helps keep the action going. It also includes a 6-month limited warranty. It provides steady airflow for the puck to float, and the mallets can be gripped with ease. The children can test how well they aim and how good they are at goalkeeping. It features an easy button for keeping track of the score. With the realistic graphic design, they can feel like they are playing the real deal. Now is the time to help them get that coordination developed while they are young. This table is meant for children 5 and up. 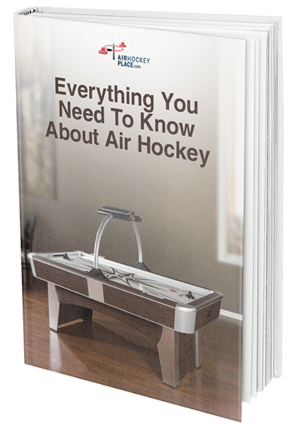 The above was a list of the six best Mini Air Hockey tables that are currently available. You should now have a better idea of which tables are the best for you and your children. We like option 3 (Mainstreet Classics) and option 6 (Ideal SureShot) the most. Option 3 Gives you that extra realistic feeling before going to the full-scale tables. Option 6 is a no-brainer for young kids who are in their initial training stages for the real deal, has a quick button to add points, and its value really can’t be beaten.